1. Trim the green beans. Trim the fennel and very thinly slice. Peel the orange and cut into segments. Slice the cherry tomatoes in half. Cut the artichoke hearts into quarters. Roughly chop the mint leaves. 2. Drain and rinse the lentils. Heat a medium-sized pan with 1 tbsp oil on a medium heat and add the fennel and green beans, cook for 5 mins until softening. 3. To the pan, add the lentils, cherry tomatoes, artichoke hearts and black olives and cook for 5 mins until the lentils have heated through. Season with sea salt and black pepper. 4. Meanwhile, to make the citrus dressing; in a small bowl whisk or mix together the apple cider vinegar with the Dijon mustard and 1 tbsp olive oil. Squeeze in the juice from 2 orange segments. Season with sea salt and black pepper. 5. 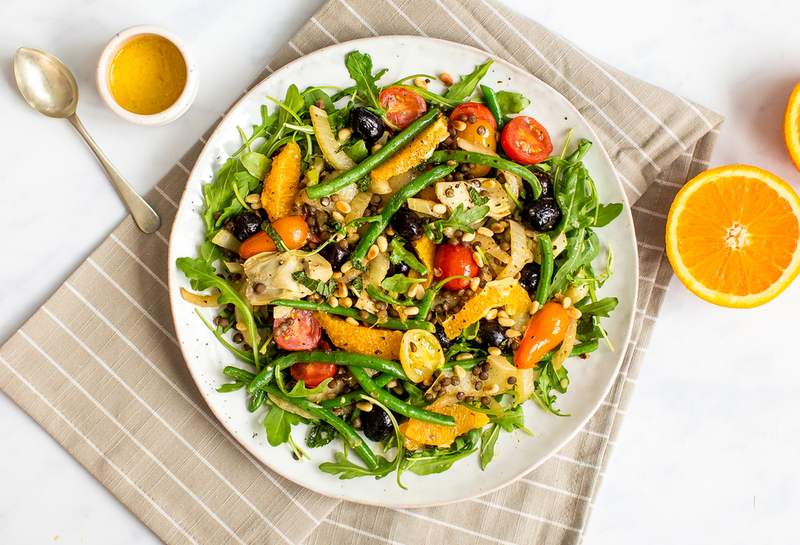 Place the rocket on two warm plates and top with the fennel, green bean and lentils mix and the orange segments. Sprinkle over the chopped mint and pine nuts. Drizzle over the citrus dressing.